Ganden MonasteryTibetan monasteries, also known as lamaseries, have traditionally been centers of learning and quiet reflection as well as places where monks lived. Found as far north as Mongolia and Russia, they have also traditionally run temples, schools and other facilities and owned large chunks of land which they leased out to farmers. Monasteries usually sponsor ceremonies to bless villages. The ceremonies are day-long sessions of chanting and horn blowing. There are currently about 1,700 monasteries in Tibet, up from 978 in 1987. Many of the monasteries are huge. The College of Esoteric Teaching in Labrang serves up meals for its monks in a kitchen with two woks, each nine feet across. Huge assembly halls, sometimes are decorated with stuffed yaks, goats and bears with stretched smiling faces, glass eyes and prayer flags pinned to them. Many Tibetan monasteries have similar characteristics. Many are built in high locations above villages and resemble fortresses. Most had or still have walls that were used to protect the monastery and its treasures from bandits, invaders and even rival monk armies. Many have meditation areas, holy sites, walls of mani stones, and a kora, or pilgrimage route around the monastery. Inside the walls is a central courtyard, where ceremonies are held and festivals are staged. It usually features a flag pole known as a "darchen" and is surrounded by a main assembly or prayer hall, known as a "dukhang," with side protector chapels, subsidiary chapels, monk quarters, a library, eating areas and a kitchen. Large monasteries have colleges, halls of residence, and an interior kora. Well-off monasteries receive many donations giving the monks more time to study and pray. Some monasteries have become dependent on the generosity of tourists to survive. The main prayer hall contains rows of low seats and tables, often covered with monk clothing and religious objects. On the main altar are statues of the Buddhist triad (the Present, Past and Future Buddhas) and perhaps important lamas associated with the monastery. On a smaller altar are butter lamps, seven bowls of water, and offerings. Monasteries often contain thousands of frescoes and statues of Buddha, Boddhavistas (Buddhist saints) and Buddhist gods such as Avalokitesvara, the eleven-headed God of Mercy. Many of the frescoes depict episode from Buddha's life. They have traditionally been used to educate the illiterate masses the same way frescoes and paintings with scenes from the lives of Christ, Mary and the saints have been used in old Christian churches to educate their illiterate followers. Inside a monastery the rooms are filled with smoke from rancid-smelling yak butter lamps and incense burners with cypress leaves. Monks beat on drums while chanting in high-pitched voices. At the entrance to most buildings are murals of the Four Guardian Kings, sometimes with a Wheel of Life or mandala mural. Inner rooms are often flanked by protector gods such as the red Tamdrin (Hayagriva) and the blue Chana Dorje (Vajrapani). The proctor chapels are often dark and gloomy. They contain images of skulls, corpses and beasts. Sometimes the images of protector gods themselves are covered by cloth because they are regarded as too terrible to look at. The three most important monasteries in Tibet---the "pillars of the Tibetan state"---are Ganden, Drepung and Sera, all of which are located outside of Lhasa. All three were badly damaged during the Cultural Revolution, and they are currently being restored. 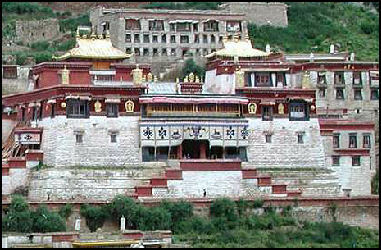 Drepung used to be the largest monastery in the world. 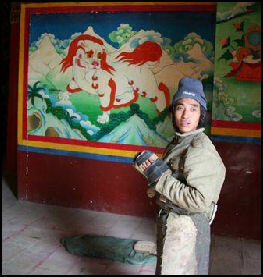 Turning Tibetan Monasteries into Communist Propaganda Centers? Pilgrimages to religious sites are of great importance to Tibetan Buddhists. Approached with the same religious zeal as Muslims going to Mecca, they are seen as both a religious duty and a chance to earn merit, plus a time to enjoy oneself and maybe an opportunity to seek a cure to an illness for themselves or a loved one. 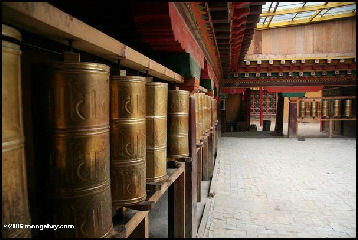 Pilgrimage sites generally have pilgrimage paths (koras) lined with prayer wheels and mani stones. Thus pilgrimages involve getting to the pilgrimage site itself and performing a pilgrimages around the site once there. The status of a pilgrims can be identified by their headgear, clothes, robes, earrings or the way their hair is braided. Pilgrims used to walk or make their way on horseback to the pilgrimage sites but now they arrive in buses and trucks. Some pilgrims travel thousands of miles in the backs of old trucks to get to pilgrimage sites. Often times much of the traffic you see on Tibetan roads is made up of trucks filled with pilgrims on their way to religious sites. They often bring their children, what little money they have and meat and vegetables to sell at a market to help pay for their trip. Pilgrims move in a clockwise direction around temples and shrines. In addition to prostrating themselves, they also drape white and yellow gauze strips around statues, spoon yak butter into lamps, turn prayer wheels, and leave small banknotes and barley grains as offerings. Many pilgrims wear an amulet called a gau that holds a picture of the Dalai Lama or the owner’s protector god. Pilgrims visiting a lamasery customarily leave a prayer scarf to honor the monasteries founding lamas. Swathes of sheep wool are sometimes hung to ensure a good harvest. The mangy dogs found around many temples survive off of hand-outs given by pilgrims. Some Tibetan pilgrims travel for months to reach Lhasa to worship at the city’s sacred temples. No matter how rich they are, they do not carry lots of money for their pilgrimage. They beg all the way to their last destination, and do the same when they return home. Even the rich monasteries send monks out to ask for alms. Some beggars in Tibet are not begging for themselves but for sacred temples, holy mountains and lakes. After begging for tens of years, they spend thousands of yuan to plate the Buddha of Sakyamuni with gold, or throw jewelry valued tens of thousands of yuan into holy lakes. Therefore, Tibetan people never skimp on giving alms to beggars. It is considered meritorious to give alms. But tourists may sometimes find themselves being pestered by the beggars. prostrating pilgrims Prostration is an important expression of Tibetan devotion. 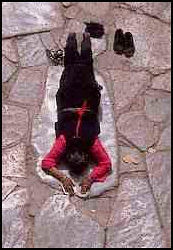 To earn merit Tibetan pilgrims prostrate themselves by lying face-down on the ground and stretching out their arms and legs. In many cases they repeatedly stretch themselves completely on the ground and touch their hands to the foreheads (representing the mind), mouths (speech) and chest (body) each time. Prostrating is practicing one of Buddhism's three Jewels for Tibetan Buddhists. Tibetan pilgrims always perform prostrations before monasteries in Tibet and before sacred images displayed on altars or when they enter and withdraw from a room. 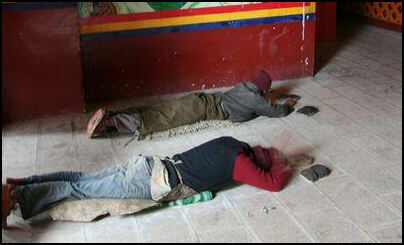 Tibetan Buddhists also prostrate before their teachers. Tibetans ideally are expected to prostrate themselves 100,000 times a year, which works out to almost 300 times a day, every day of the year. Not only do they prostrate themselves around temples they also do it on roads, streets and sidewalks. Some pilgrims cover the entire 33-mile route around Mount Kailis or travel from their hometowns to Lhasa, repeatedly prostrating themselves. Pilgrims who repeatedly prostrate themselves while making the circuit of Mt. Kailas take one step, make a Tibetan prayer gesture, raise their hands in prayer, and lay down on the ground, their arms extended in front of them. Then they stand up and place their feet where their fingertips had just touched and repeat the process again. Those that do this often wear knee pads, aprons and canvas shoes on their hands and take two or three weeks to complete the journey. Prostrating pilgrims: 1) stand straight upright, chant sacred words, usually “Om Mani Padme Hum,” put their palms together, raise their hands up over their heads, and take a step forward; 2) lower their hands down in front of the face, take another step forward; 3) lower their hands down to the chest, separate both hands, stretch them out with the palms down, kneel down to the ground, then prostrate with the forehead knocking the ground slightly. 4) Stand up again and repeat the whole procedure. Another, simpler method is to walk around the monastery in a clockwise direction and prostrate. Another centre of Saga Dawa activity is Mt. Kailash. During Saga Dawa, Mt. Kailash draws tens of thousands of pilgrims. For over a thousand years pilgrims have flocked to Mt Kailash to replace the Tarboche flagpole, a huge pole that stands on the Kailash kora (hiking circuit), south of the mountain. The ceremony is led by a lama from the nearby monastery and Tibetans and Buddhists gather here to attach their prayer flags, to pray and to help erect the flagpole. Tibet has hundreds if not thousands of pilgrimage sites. In additions to famous monasteries and mountains, pilgrims also head to caves associated with famous yogis, power places where people meditate on mandalas and rock formations that conjure up some Buddhist image. Certain pilgrimage sites have special attributes. Circling Lake Manasarovar is supposed increase the likelihood of spontaneous buddhahood while a circuit of Tsaro is supposed to help one gain the power to fly in their next life. Doing pilgrimages in certain places is more auspicious than others. Sometimes the merit earned from doing the same pilgrimage increases exponentially each time it is done. At the pilgrimage sites the pilgrims do koras, visit monasteries, pray, leave offerings at alters, honor revered lama, turn prayer wheels, collect sacred rocks, drink holy water, tie prayer flags, throw tsampa into the air, chant mantras, and top off butter lamps.. Circuits of 3, 18 and 108 at sunrise and at sunset are particularly auspicious. Mt. Kailas is a 22,028-foot-high (6,714-meter-high) pyramid of ice and rock and the highest peak in the Kailas Range, a group of sacred mountains north of main Himalayan range and the source for three sacred rivers-the Indus, the Brahmaputra and Sutleh. Mt. Kailas is considered to be the center of the universe to Hindus and Buddhists, who regard the mountain an earthly image of the heavenly peak, Mt. Meru. Hindus regard it as the paradise home of Shiva, one of their most important Hindu gods. Tibetan Buddhists believe the 11th-century poet and mystic Milarepa was carried to the peak on the rays of the morning sun. According to ancient belief, the Ganges descended from Mount Kailas to a spring called Chlimikthungtool, where it was said the sand was composed of emeralds and cat's eyes and people who drank the water became as strong as horses. From there four great rivers---the Ganges, the Brahmaputra, the Indus and Sutleh emerged in pipes in Lake Manasarowar and after circling Mount Kailas and the lake seven times began flowing to the east, south, west and north. No person has ever climbed Mt. Kailas. In the late 1990s, Beijing gave permission to a Spanish expedition to make the first assault on the summit. Tibetans and others were outraged by such an overt political decision by Beijing and the possibility of the sacrilegious act to Buddhists and Hindus. In the end, the Spanish expedition didn't make the climb. The famous climber Reinhold Messner was invited to climb it in the mid-1980s. He refused. 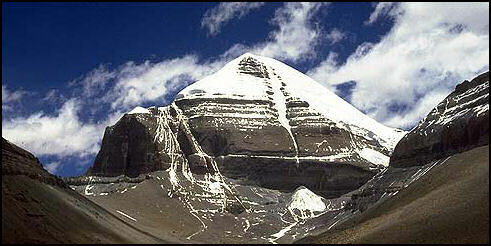 The 33-mile trek around Mount Kailas is one of the holiest acts for Buddhists, Hindus, Jains and Bonpos. Pilgrims from all four religions do the trek. Tibetan Buddhists believe that one trek around the mountain cleanses one of his or her sins and 108 circuits (an auspicious number to Tibetan Buddhists) will lead to nirvana in this life. Each year thousands of pilgrims complete the hike, known as the kora. Most of them follow the Buddhist custom and walk clockwise around the mountain. A few pilgrims walk counterclockwise. They are mostly followers of the animist Bon religion. The main pilgrimage season is in May. Many of them prostrate themselves at regular intervals. Along the route are discarded clothing and drops of blood left by pilgrims who cover the distance on their knees. Those who prostrate themselves, take one step, make a Tibetan prayer gesture, raise their hands in prayer, and lay down on the ground, their arms extended in front of them. Then they stand up and place their fee where their fingertips had just touched and repeat the process again. Those that do this often wear knee pads, aprons and canvas shoes on their hands and take two three weeks to complete the journey. The official beginning is marked by cairn of stones a couple miles out of Darchen. Along the way are yak skulls, cairns, numerous sites associated with deities, spirits and famous lamas, and great views of Mt. Kailas, barren peaks and huge rock formations. At Tarboche there is a wooden pole smothered in prayer flags, white scarves. Some pilgrims gather around the pole to dance and sing. The pole is usually raised during the Saga Dawa festival in May or June. Nearby is a sky burial site and small walk-through stupa-like structure called Kangnyi. Bonpos leave behind ram’s heads and braided tails here. Pilgrims and Westerners alike spend the night in small guesthouses at monasteries spaced along the route. The "beds" are rough wooden planks, sometimes covered by dirty cotton mattresses.